This incredibly detailed miniature dollhouse Mounted Trout Wall Plaque is a 1:12 scale, handmade, wooden wall mount style mounted fish. Use wax, glue or whatever you like to mount it on a dollhouse wall. The Mounted Trout Wall Plaque measures 2.73" wide by 1.11" tall by 0.2" deep. Perfect for your fishing cabin! 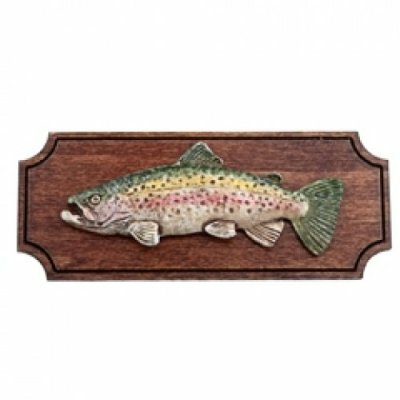 This Mounted Trout Wall Plaque is supplied by Harville Miniatures, which generally ships within 1 business day(s) of you placing your order .